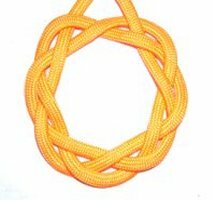 Description: These two Ring Knots are fun and easy to make, so they can be used in children's projects. 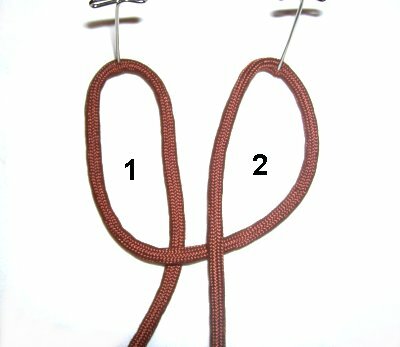 They are both very similar, but the process for tying them is different. Ring shaped knots can be used to make coasters, rugs and pot holders, if you make them large. You can make rings and pendants if you use fine material to make them small. In the images, I used 4mm Paracord, which resulted in a pendant-size design. 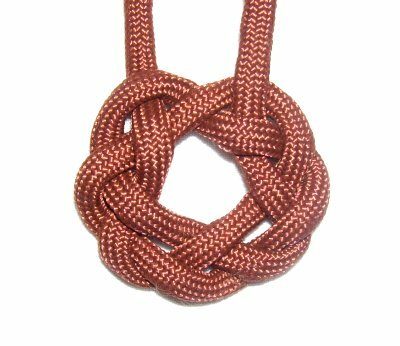 The Keyhole Knot starts with a small variation of a Panel knot, called a Postage Stamp. The bottom is changed to create an opening in the center. 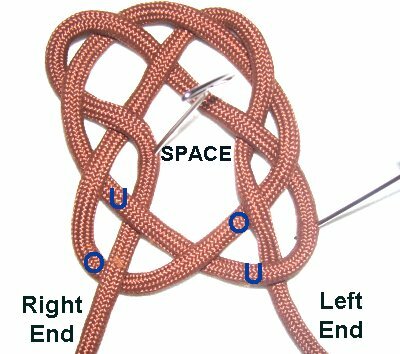 The Celtic Ring Knot is a type of circular braiding. You can use a separate piece of material, or the end of the same cord, to thicken the design. 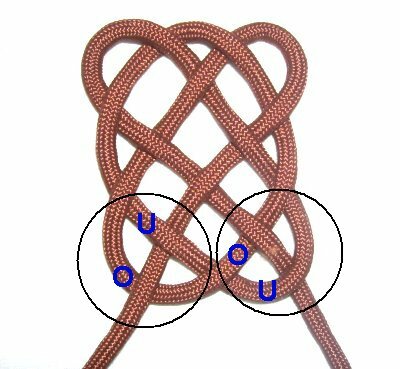 I found the Keyhole Knot on the Fusion Knots website. Click on the image or link to visit the site, and be sure to check out the video gallery. 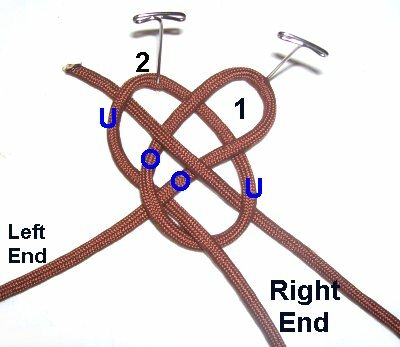 It contains free tutorials for a variety of unique knot designs. The Celtic Ring knot is made with several angles, which need to be secured. Make sure you use a project board and sturdy pins. You need one piece of material, at least 36 inches long. To double the knot with the same cord, make sure it's at least 72 inches long. Step 1: Secure one end to your board. 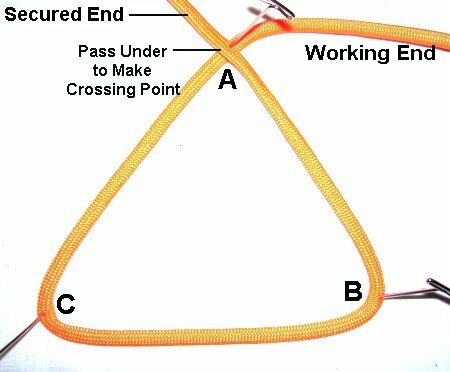 Use the working end to make a triangle, moving in a counter-clockwise direction. Mentally label the three angles A - B - C, as shown. At the top, pass the working end under the secured end to make the crossing point. Step 2: Use the working end to make an inverted triangle, moving counter-clockwise. The working end needs to pass under angles B and C.
At the top, pass the end under - over the two segments at angle A.
Mentally label the new angles D - E - F as shown. 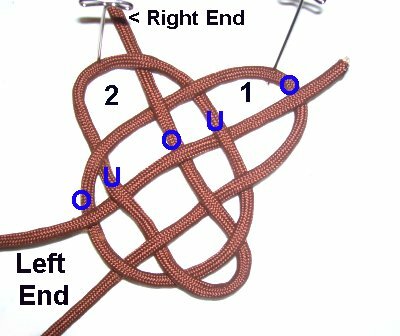 Step 3: Move the working end left to right, passing under angle D, located in the upper right area of the Celtic Ring Knot. Step 4: Bring the working end down to angle B, at the lower right. Pass the end over - under the two segments heading right to left. 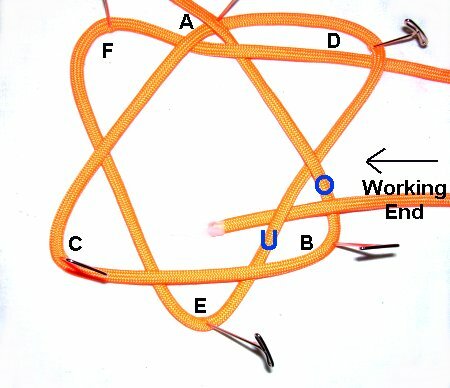 Step 5: Bring the working end down to angle E at the bottom center area of the knot. Pass it over - under the two segments, moving right to left on a downward angle. Step 6: Bring the end to angle C, which is on the lower left. Pass it over - under the two segments, moving left to right on an upward diagonal slant. Step 7: Bring the end up to angle F on the left. Pass it over - under the two segments, heading vertically. Bring it over the secured end. Step 8: Tighten the design so it forms a round shape. 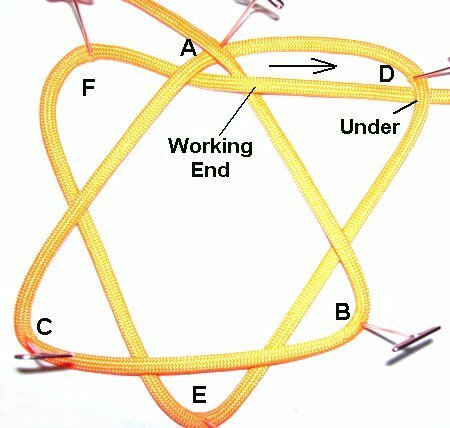 For a pendant, you can use the two ends to make a necklace. Or you can weave them through the top of the knot and finish them off, for an item like a coaster. 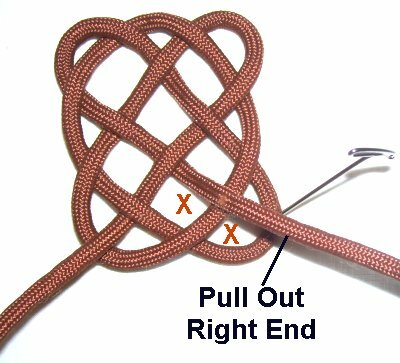 To thicken the Celtic Ring knot, use either a separate cord, or the working end. 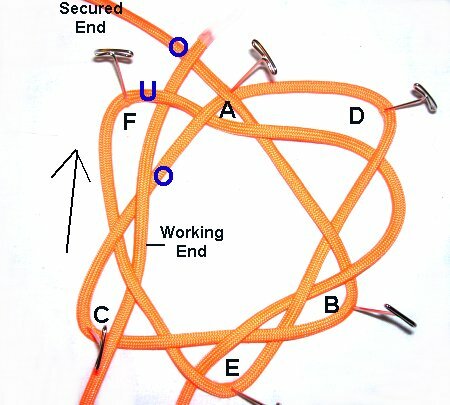 Follow the path of the first knot, starting at the secured end. 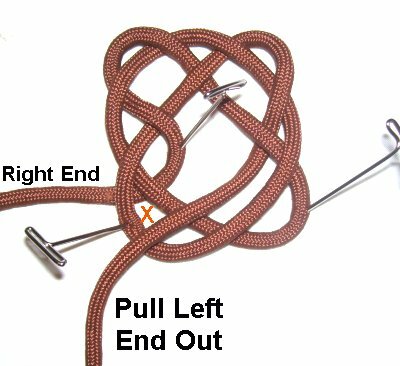 This is the most challenging of the two Ring Knots. You'll start off by making a Postage Stamp Panel knot. Cut one cord, at least 36 inches long. 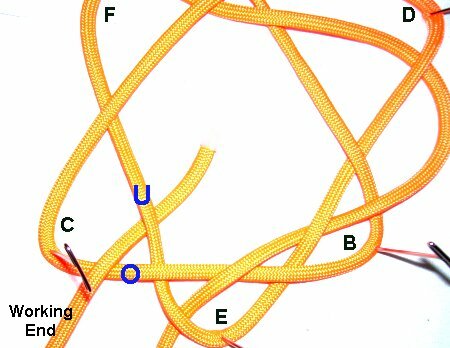 You can double this knot by cutting a second cord (optional). Step 1: Secure the left end to your board. 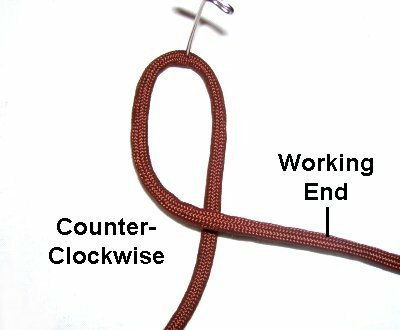 Make a counter-clockwise loop with the working end. Secure the loop at the crook (rounded portion). Step 2: Make a second loop in the same manner, using the working end. It should rest to the right of the first one. 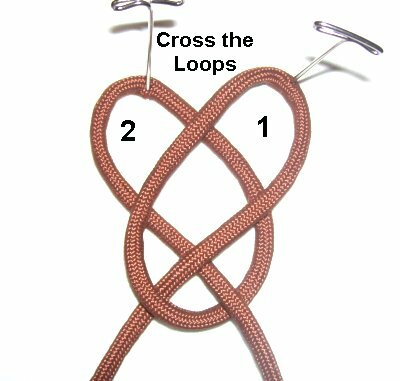 Make sure both loops are long and oval shaped. Step 3: Move Loop 1 to the right, so it rests on top of Loop 2. Move Loop 2 to the left, so the center area is crossed as shown. Re-secure both loops, and make sure they are wide and open. Step 4: Weave the right end through Loop 2, heading right to left diagonally. Pass under the segment at the bottom,and over the two segments of Loop 1. Pass it under the crook of loop 2 at the top. Step 5: Weave the left end through Loop 1, moving left to right. Weave over - under - over - under - over the segments as shown. 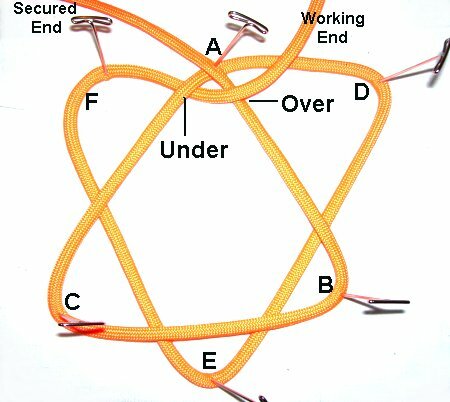 Rotate the knot so the ends are at the bottom. Do not flip it upside down. 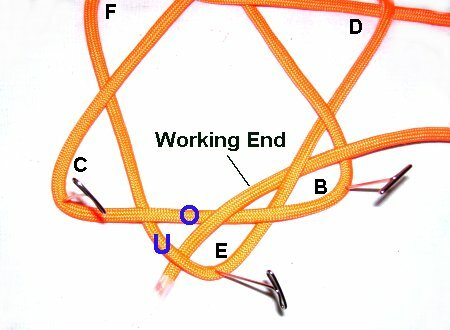 Adjust the loops and tighten the knot slightly. Note the areas circled at the bottom in the image above. On the left, the end comes out of the knot under - over. On the right, the end comes out over - under. The next few steps will focus on re-positioning the two ends, changing where they come out at the bottom. Step 6: Pull the right end out of the 2 segments at the lower right area of the knot. The areas are marked with an X. Step 7: Move the right end to the left side of the knot for now, and secure it. Secure the lower curved area where you are working, to make sure it stays in place. Step 8: Pull the left end out from the under the segment on the lower left. The area is marked with an X. Step 9: The ends now switch places. Position the left end so it goes over - under the two segments on the lower right. Move the right end (now on the left), under - over the two segments at the lower left. Tighten the Keyhole knot gradually, starting at one end and removing the slack a little at a time. 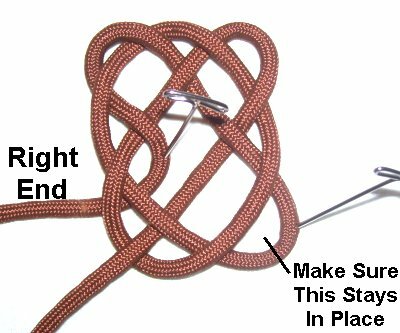 Ring Knots can be a challenge to tighten, so take your time to form a round shape. Have any comments about these Ring Knots? Contact Me.